A pilot trains in the MASTIF. 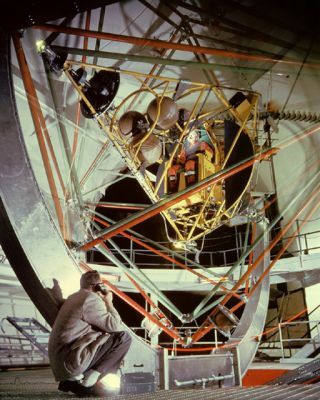 In this historical photo from the U.S. space agency, the Multi-Axis Space Test Inertia Facility (MASTIF) also known as the Gimbal Rig in Altitude Wind Tunnel (AWT) with pilot during Project Mercury. The Gimbal Rig was used to train astronauts how to pull the space capsule out of a potentially dangerous spin and regain control of the spacecraft. And boy, doesn't it look like fun?! The training and tests were run at the Altitude Wind Tunnel at Lewis Research Center, now John H. Glenn Research Center at Lewis Field.